After double-digit drops in premiums in 2010 and 2011, ALLIANZ-TIRIAC revenues stabilized in 2012, managing even a slight increase of 0.3%, helped by the positive evolution of life insurance and retail sales on all non-life lines. The company ended the year with gross written premiums worth RON 908.9 million. Life insurance had an advance of 8.2% to RON 102.4 million, due to the sale of new policies and the drop in surrenders, its share out of the total portfolio going up one percentage point to 11.3 %. Meanwhile, although the number of retail customers increased, non-life underwritings fell by 0.7% to RON 806.4 million, affected by the leasing portfolio expiration. The claims activity also stabilized, according to the company, the claims payments decreasing by 0.2% to RON 538.9 million. Preliminary annual figures indicate an RON 6.5 million operating income, compared with RON 11.1 million in 2011, made exclusively on the investments activity. The profit drop is the result of increased claims ratio in the motor and property lines, the technical result being negative, in fact, both for non-life and life insurance segments. Thus, under the non-life loss ratio increase by 4 percentage points to 77.6%, the net combined ratio was 105.9% in 2012, hence a technical net loss of 5.9% in the non-life portfolio. “Competition is very strong on the local insurance market and it is seen not only in price but also in terms of financial strength, quality of service and ultimately, the consumer confidence. […] ALLIANZ -TIRIAC is the local loyalty leader in the protection and financial planning fields and this is the recognition of the high level of quality our services offer. For us, this is extremely important because it is a very solid base that we can continue building sustainable business on,” said Remi VRIGNAUD, CEO of ALLIANZ-TIRIAC. 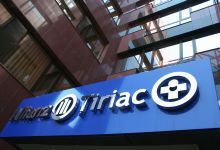 Regarding the objectives pursued by ALLIANZ-TIRIAC in 2013, the company’s CEO said that caution regarding their expectations remains the same and that the stake will be placed on quality and efficiency. The insurer will also reconfigure its portfolio to become more accessible for all clients, from individuals to SMEs and, last but not least, for large companies.